Clad in a spring-weight dress coat, no gloves and a jersey dress, I was completely prone to the wind that ripped through my few layers in a matter of ten seconds. When I packed for my business trip to New York I failed to remember that “north” means “colder”. Swinging the rental car door shut I scurried to the gas pump and swiped the company card. Enter Zipcode. I hastily punched in the code and hit enter. Enter Zipcode. I punched it in again. I glanced at the clock and clacked over to the gas station hut, a metal igloo stacked with Camels and Wrigley gum. A man disinterestedly gazed from within the glass cave. Okaaay. I entered the numbers – numbers I KNEW were the zipcode for my hometown – and the same thing happened again. I could feel my temperature rising but it was doing nothing for the cold – my hands were now numb. It was then I realized the university I work for has its own zipcode. “Great,” I muttered. Punched it in: See Attendant. Back I clacked, this time to the front of a line of four or five people. “Hi, it’s saying to see you again.” The man said nothing, punched his computer screen and then stared at me, which I assumed was my cue to go. Back to the pump I went, swipe, punch, zipcode – See Attendant. Did I mention I was on my way to church? It’s not the first time I’ve used such choice words. Or rather, words of choice – those few who make themselves readily available in situations such as these. They lie in wait for stress, anxiety, car doors and thumbs to make their grand entrance. Not everyone struggles with their mouth and not everyone struggles with their mouth in this way. While I’m not proud about my temptation to swear when frustrated and angry, I’m not going to pretend I haven’t done it, as the story above illustrates with painful clarity. But there’s a bigger issue at play here; a question that may seem silly to ask but in a culture of compromise is one many Christians are asking: should I do anything about it? It seems like a basic question. But in recent years a trend in Christian thought has some progressing toward the acceptance of cussing in the life of a Christ follower. “It’s not a gospel issue”; “Let’s stop getting hung up on minor issues”; “Let’s concentrate on what’s really important”. I noticed it in others before I noticed in myself, and I don’t say that in a prideful manner but as a simple observation. I found myself taken aback at how easily fellow Christians exclaimed, “Oh my God!” and “Jesus-” as if the names meant nothing. When Josh and I stopped going to the theater because of the intensity of the language, I began to notice how I myself slipped into the use of ‘fake’ cuss words and, in car-door-cold-wind situations, maybe even let out a real one. 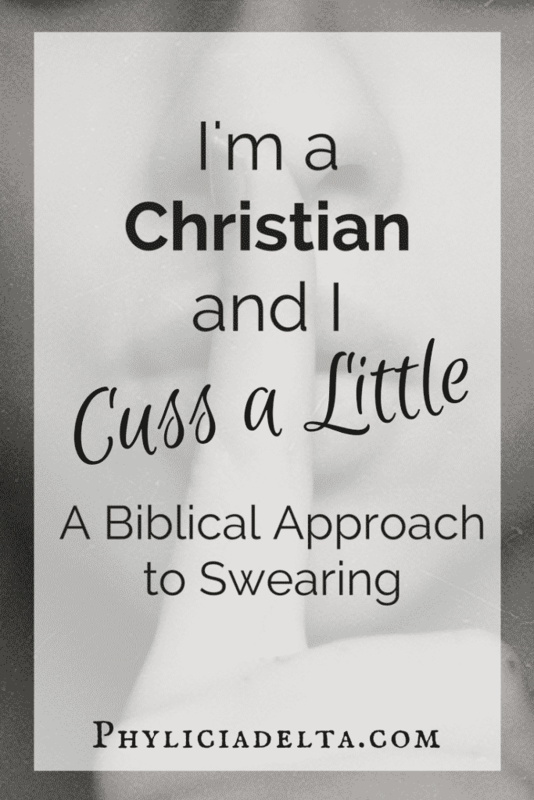 So I’m a Christian, and I cuss a little. Is that so bad? Actually, it is. And here’s why. To God, there is power in a name. Names have great meaning; throughout the Old Testament we can see names being used to describe people (Adam, Eve, Abraham, Isaac, Jacob, Esau, and many more). God’s name is also a descriptor: He is the One and Only God, not just ‘god’ in the sense our world uses, but God. The only one. Jesus, or Yeshua, is the Greek form of the name Joshua, which means God is Our Salvation (I favor it, since it’s Josh’s name). Jesus’ name described His person and purpose in this world: He was, and is, both God and our salvation. The names of God and Jesus don’t just have weighty meaning; they have great power. The Lord’s prayer says that God’s name is to be hallowed (Matt. 6:9). Philippians 2:10-11 says that “at the name of Jesus every knee will bow… and every tongue confess” that He is Lord. In Acts, Luke states that “under no other name” can anyone on this earth be saved for eternity – not Buddha, not Allah, not Joseph Smith or Reverend Moon – Jesus, and Jesus alone. It is not okay to take the name of God in vain. It is not okay to waste the power of the name of Jesus on anger or frustration. And while this may seem harsh, to speak God’s name in such a way is demeaning, irreverent, and worse – it breaks the very law of God. Let’s take a walk back to the gas pump. What about phrases like “go to hell” and “damn it”? What about a-words and b-words and f-words? What about ‘Gosh’ and ‘Golly’ and ‘Darn’ and ‘Dang’? Before I deal with the crux of the issue, I want to shortly mention something a friend told me that I never forgot (but don’t always implement). Kristen once told me that “to use the word “damn” is to act as if one has the power of God Himself”. Since God is the only one who can condemn to Hell, when we usurp that power with our words it is an offensive act of pride in the face of God. God doesn’t enjoy sending people to Hell. In a way, God doesn’t ‘send’ them; they choose to reject God and by doing so, they choose separation from God – the only place where evil can thrive. By choosing to say ‘no’ to God they say ‘yes’ to separation, and that separation is Hell. God doesn’t like it. He hates it. God’s heart is for ALL people to be in His presence and abiding in His love (2 Peter 3:9). So when I condemn a gas pump to hell in a fit of anger, I am assuming 1) a form of God’s authority; 2) acting in an ungodly manner and 3) taking God’s power in vain. Damnation is a power of God alone. It is not to be taken lightly because God does not take it lightly. Jesus said to “let your ‘yes’ be ‘yes’ and your ‘no’ be ‘no'”, not making unnecessary oaths or usurping control where power belongs to God (Matt. 5:33-37 – read it). God doesn’t just command this for the sake of His name, but for the sake of us, His people. We are to be set apart in a world of darkness. Have you ever noticed that the qualifications for a ‘good person’, in the world’s eyes, is usually summed up in “He doesn’t drink, smoke, swear, or gamble”? These simple, outward choices reflect a difference. We choose to avoid these things because as Christians we are made holy and because of that grace we choose to walk in holiness. We shouldn’t be looking for how far we can go but how holy we can be. And that includes our words – yours, and mine. So why are we looking for excuses to become like the world? All crude, ungracious, angry or corrupting talk is the product of a flesh-driven decision and is never the product of the Spirit of God. God’s heart is for us to be so in tune to His heart and Spirit that our words reflect His nature: the kindness, love, and patience of a gracious and good God. But here’s the thing: when you don’t know somebody, you don’t value their name. The morning at the gas pump I had not been in the Word. I was in a hurry and rushed out the door. If I had spent even a few minutes with God that morning, I would have felt a check in my heart at the gas pump. I would have remembered the God who loves me and stopped myself from mocking His power in a moment of frustration. If you do not spend time reverencing God, your words will reflect your irreverence. What About the ‘Fake’ Swear Words? We know what God has to say about swearing and cursing in general. It’s in the Word for all of us to read in black and white. But what’s not so black and white are the ‘gosh’ and ‘darn’s we use to replace the words so offensive to our Lord and Savior. I’m not going to lay down legislation outside of what God’s Word says, so let this be your guide, and I’ll let it be mine: if your words still permit you to reflect your worship and reverence for God, then by all means, use them. People are listening. Somebody by my gas pump probably heard me, and what beats me up inside is he would never know from any outward sign that I was a follower of Christ. That’s why holiness is so important in our actions, dress, and words. It’s why it’s not okay to say “Oh my God” and condemn gas pumps to hell. We are called to the consecration of holiness in a world that is far from holy. It won’t be easy. Jesus never said it would be. But He has promised to be our Help. The Spirit of God testifies through us to the grace and truth of Jesus Christ. We can’t testify to Jesus and mock Him at the same time. 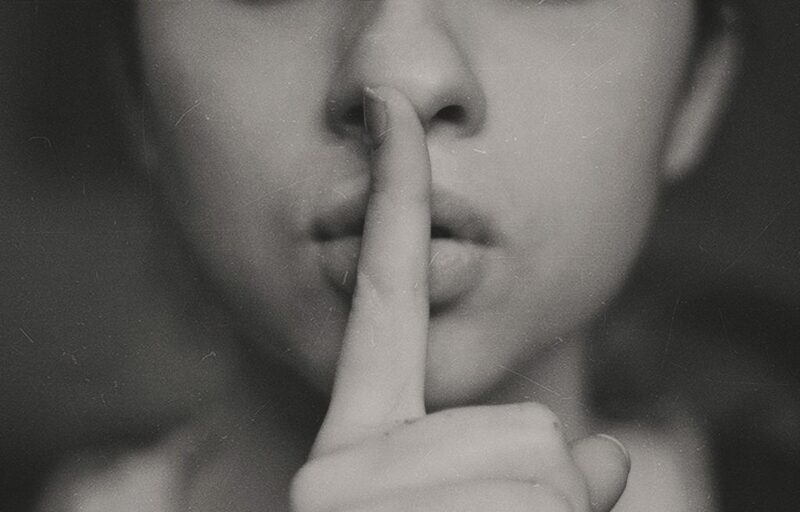 So gas pumps or slammed doors, bad hair days or fights with your spouse – join me in using our words to testify to grace. It’s what our mouths are meant for.